ISTANBUL (Reuters) - Turkey accused Russia of a "provocation" on Sunday after a serviceman on the deck of a Russian naval ship allegedly held a rocket launcher on his shoulder while the vessel passed through Istanbul. Relations have deteriorated sharply since Turkey last week became the first NATO member in more than half a century to down a Russian plane, which it said had violated its airspace while flying sorties over Syria. The pilot was killed. The NTV news channel broadcast photographs that it said showed a serviceman brandishing a rocket launcher on the deck of the landing ship Caesar Kunikov as it passed on Saturday through the Bosphorus Strait, which bisects the city of Istanbul. It said the ship was believed to be en route to Syria. 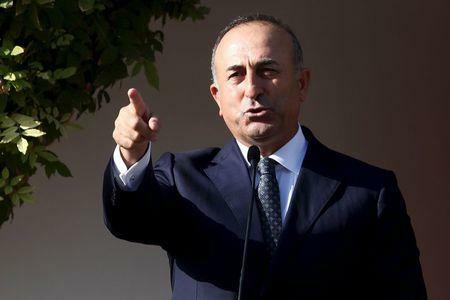 "For a Russian soldier to display a rocket launcher or something similar while passing on a Russian warship is a provocation," Foreign Minister Mevlut Cavusoglu told reporters, according to the Hurriyet news site. "If we perceive a threatening situation, we will give the necessary response." The Bosphorus offers the only passage to the world's oceans for the Russian Black Sea fleet. A World War One-era treaty obliges Turkey to allow all ships to pass during peacetime. Turkey had considered Russia a strategic partner as its main energy supplier, despite deep differences over Syria. But since Turkey shot the plane down, Moscow has introduced economic sanctions including a ban on Turkish foods and other products worth as much as $1 billion.NTV said three NATO frigates with Canadian, Spanish and Portuguese flags had been moored in Istanbul as the Caesar Kunikov passed through.